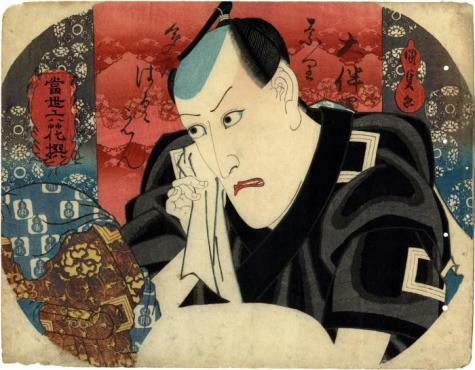 Danjūrō's crest, the mimasu or three nested measures of rice, is visible on his robe and in the lacquer work of the mirror he is looking into. Draping the mirror is a blue and white printed cloth with the 'yau seal' in a gourd motif. This is an alternative name for many Ichikawa actors and also the name of the family's residence in Fukugawa. It appears on another print in the Lyon Collection. See the link to the Ebizō VI Danjūrō VII above.